Versailles formed in 2007 and they quickly became one of the leading acts of the visual kei scene. 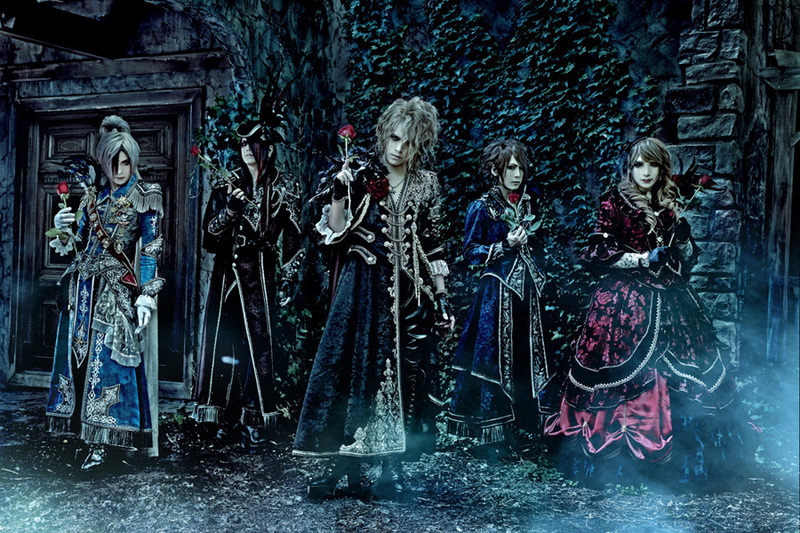 The key to their success was their elaborate costumes, their unique take on symphonic heavy metal and most importantly the two established and well known musicians, that formed the band Kamijo, former singer of vk bands Lareine and New Sodmy and Hizaki, a virtuoso metal guitarist, known for his solo works and participation in various other projects. They released several albums, did world tours and then, all of a sudden, at the peak of their success, they decided to call it quits in 2012. 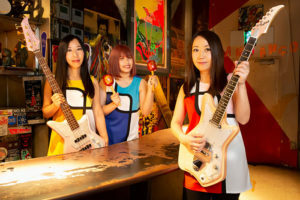 It was unclear if they disbanded or just went on a hiatus, but eventually they had a reunion show at the end of 2015 and announced a full restart this year, releasing a best of album with new tracks. And soon afterwards they also announced that they will return to Europe early 2017. So, I had a lot of things to ask in the email interview that I got the opportunity to do, starting with the most obvious of questions… But before reading on, please keep in mind that they like to keep an aura of mystery around them, so some of their replies might be a bit hard to decipher and the somewhat broken English does not help much either. What were your reasons to go on a hiatus in 2012 and why did you decide to restart now? KAMIJO (vocals): We were not getting along really well as a band, so we decided to stop our activities. Today, all members have the same target and we get along well. So we decided to make Versailles rebirth. MASASHI (bass): The members were out of gear, so we suspended our activities. When we came in gear, we restarted. TERU (guitar): Each of us needed to go act outside of Versailles. With this experiences we could come back to Versailles with refreshed spirit. YUKI (drums): The target which each of us were having didn’t match. So, we suspended our activities, but now we have the same target, so we came to the rebirth. HIZAKI (guitar): We had some problems with member staffs. The time has come to rebirth. Your first new release was a compilation album. How did it feel to listen to your old songs again? 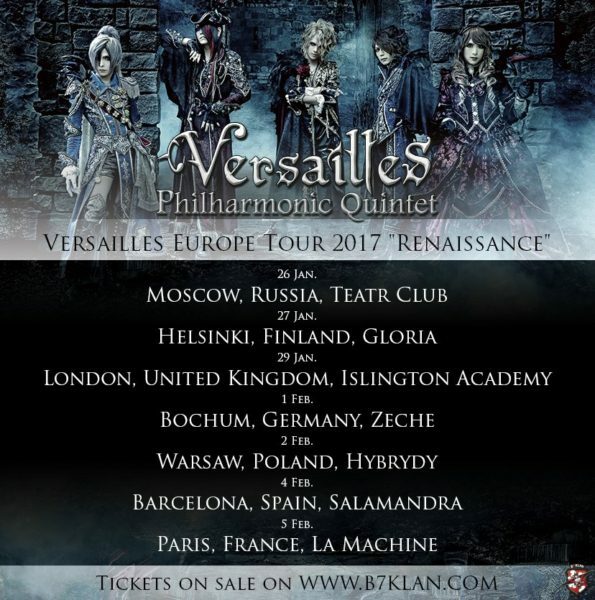 Are you 100% satisfied with the previous Versailles albums or is there anything that you think you should have done differently? KAMIJO: I still love the old songs. MASASHI: We recorded all newly and it includes our representative 2 new songs. So, I’m satisfied. TERU: I’m an artist. Never satisfied, but we did our best. HIZAKI: Recent evolution of technology is so fast, so I compare this point well. During the hiatus you all kept creating new music… solo works, Jupiter (the band the other four members besides Kamijo formed with a new singer) and so on. Could you achieve what you wanted to with these projects? 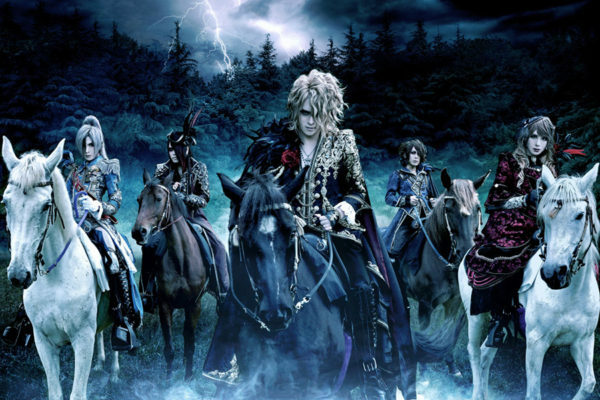 KAMIJO: I will keep my solo activities beside Versailles. 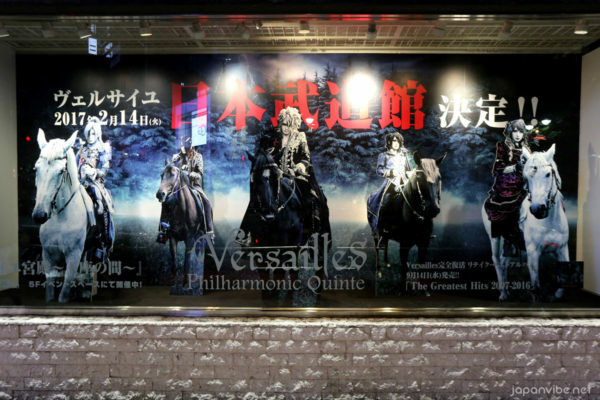 MASASHI: I will do anything I can bring to Versailles. TERU: Jupiter will keep being active. YUKI: I will keep doing all which help me to evolve as a musician. HIZAKI: I will keep doing everything with full power. 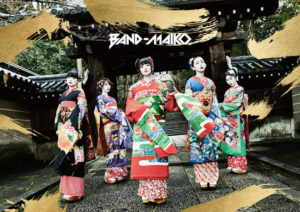 Will there be any noticeable change in the band’s music style? KAMIJO: If there was change, it would be a fake. MASAKI: Basically, there is no change. YUKI: I don’t know, but I think there is no change. HIZAKI: I try to make guitar phrases which would fit to each member. Your previous albums were concept albums with elaborate background stories. Is this new era for Versailles also a start of a new story? KAMIJO: Yes, because if there is no story, I can’t write lyrics. And what are your inspirations for these stories? Books, history, movies or maybe something else? How did you first encounter the renaissance culture and how did it became such a big influence? KAMIJO: I love all the works of Leonardo Da Vinci. I think his works go over art. Hizaki, you released a solo album called Rosario recently, could you tell us about that? HIZAKI: It’s a guitar instrumental album, but I’m playing as if I’m singing a melody. So, I think it could be enjoyed by anyone. In our interview back in 2007, I asked you about you musical influences. But who and what are your main influences and motivations outside the music world? HIZAKI: Nature, such as mountains or rivers. Do you have any special hobbies besides being a musician? MASASHI: Driving and my cat. You will be going on a European tour early 2017. What can the new and old fans expect from your shows? KAMIJO: We will give you the biggest emotion. MASASHI: I think you will find Versailles more beautiful. TERU: I wish to wait for you with a set list made for you. 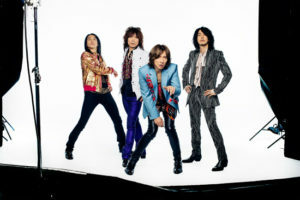 YUKI: We make you feeling reasons to love Versailles. HIZAKI: We make a stage presence even when you see us for the first time. And the last question…. : Why are you so attracted to roses? Do they have a special meaning for you? MASASHI: Versailles = Rose. So, it’s as important as the band. TERU: Rose symbolize Versailles. So I want keep blooming like a rose. YUKI: Roses are as important for us as our music. « Endon: Through The Mirror – new studio album, mixed by Kurt Ballou of Converge!